A very silly action film from 1996, Chain Reaction starred Keanu Reeves and Morgan Freeman as a scientist working on “the hydrogen energy project” and his boss, respectively. After Reeves’s team makes an incredible discovery, one of his fellow boffins is murdered and – would you believe it? – he gets framed for it, along with his co-worker Rachel Weisz. And to everyone’s great surprise, Freeman’s character just might not be the friendly figure he first appears. Director Andrew Davis was capable of making a good action movie (for instance The Fugitive) but this was formulaic and predictable and just too daft. 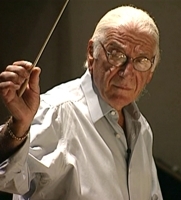 Director Davis has worked with numerous different composers, including James Newton Howard several times, but Jerry Goldsmith really was the go-to guy for this type of film for a long time. He was probably Hollywood’s best action music composer in 1966, he certainly was in 1976 and 1986 and in 1996 was truly peerless. Chain Reaction was the second in a sequence of four reasonably similar scores for action movies he did in the space of two years at this time (in between various others), after Executive Decision and before Air Force One and U.S. Marshals. They all share lots of common DNA, though each has its own distinctive flavour. Chain Reaction has a slightly industrial feel thanks to its synths and the use of anvil and there’s no doubt that its action music is its finest component, but it does have a surprisingly long-lined main theme that at times is really quite warm. It gets an extended, developed arrangement in the opening cue “Meet Eddie”, heard for trumpet then horns, with an odd electric guitar motif (just two notes) alongside it, a device Goldsmith later used in Small Soldiers of all things. As was customary for the composer in these scores, there’s a full-blown romantic statement of the theme for the finale (“Out of the Hole”) which makes for a rousing, sweeping finale, but in between those bookends the malleable theme appears in some guise or other numerous times. The action material is excellent throughout (often built around the same secondary theme), those familiar darting string runs punctuated by horn fanfares, percussion crashes and fluttering flutes in the composer’s unmistakable style. “Too Late”, “System Down” and “Open Door” are all excellent, but in truth there are two lengthy action cues (around six minutes each) which stand head and shoulders above the rest and are absolute belters. “Be Safe” and “Ice Chase” are both pulse-poundingly exciting, proof positive of Goldsmith’s mastery of the craft which make a silly film seem worth watching. There is so much energy in them, such artistry. The original Varèse album from 1996 was a very enjoyable half-hour affair offering lots of quality material, a nice blend of the softer moments with action and suspense, but as with many of the composer’s scores of the period it was mystifyingly dismissed by many at the time. No other composer has ever been as capable of writing music this interesting for straightforward movies without any real hooks like Chain Reaction – no, it’s not Capricorn One or Total Recall, but compare it with (far more celebrated) scores like The Fugitive and it’s simply streets ahead. This 75-minute expanded release offers few surprises but does feature the spectacular “Be Safe” and while the optimal album would probably fall somewhere between the two, there isn’t really a dull moment to be found; it’s one of the composer’s most underrated scores. I’m delighted this period of the composer’s career is being positively re-evaluated now; I liked it just fine at the time but these scores sound even better today. There’s also one or two pretty good unreleased action cues as well. I’m not saying this score would fare well in a complete form but expanded would be pretty awesome. by the maestro. La La Land and Intrada will hopefully get their hands on them one day soon). How about a complete Ghost and the Darkness? Intrada already did a complete Ghost and the Darkness. I should point out that the first two comments on this post were from a previous version of the review, written in 2012 about the original album release rather than the deluxe edition.